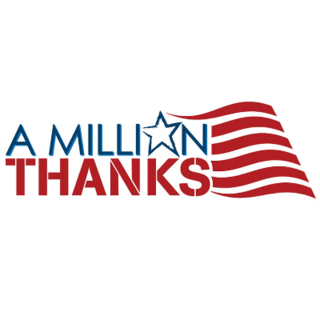 A Million Thanks was founded in 2004 by 15-year-old Shauna Fleming with the goal of collecting one million cards and letters of appreciation to U.S. military serving overseas. With the help of grateful Americans, that goal was surpassed within six months. The organization has expanded and to date has collected over 7.5 million cards and letters for our troops. In addition, A Million Thanks grants wishes to injured veterans and provides scholarships to children of fallen military. A Million Thanks is the one-stop-shop for military support!